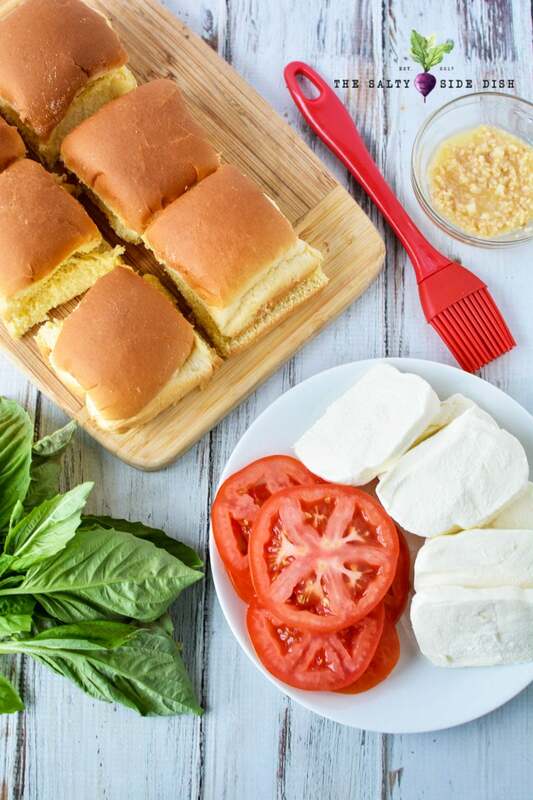 The Caprese Sandwich (often called Caprese Slider are a delicious way to get your tomato, mozzarella and basil right into a personal sized appetizers. Easy to whip up and dripping in melty cheese, talk about a party favorite!! School is back in session and the kids have gone through their first “BTS” colds. Thank fully those are clearing up so we can get back to some regular food around here. I think when everyone is running a fever, I tend to default to terrible food choices. Carrot cake for breakfast, french bread for lunch and waffles for dinner. CHECK. But now that we are just about back to normal schedules, there really is no excuse to start meal planning again. And this little caprese slider sandwich, it makes the grade. No doubt Italian recipe options are a family favorite, so if you love this food combo, try my recipes for amazing and traditional caprese salad, caprese salsa, these awesome lady bug caprese appetizers, or these perfect caprese skewers. I also just put up a delicious Caprese pizza recipe this week that is DIVINE! There are so many recipes to love that you do not have to just choose one and making something homemade and homecooked with love is one of the many pleasures of life. Love caprese but don’t always want it fixed up in a salad? Me either! Life is too short so create some variety. 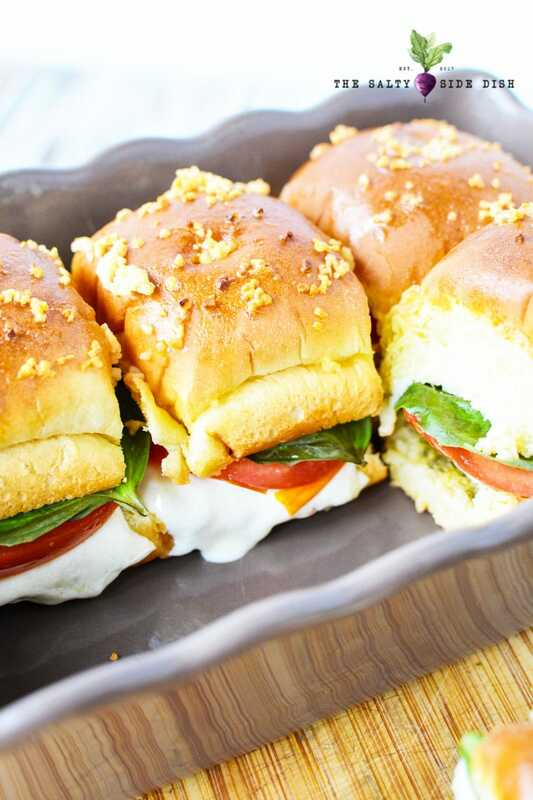 Serve caprese sliders up for lunch, diner, or appetizers, its 1-2-3 EASY. 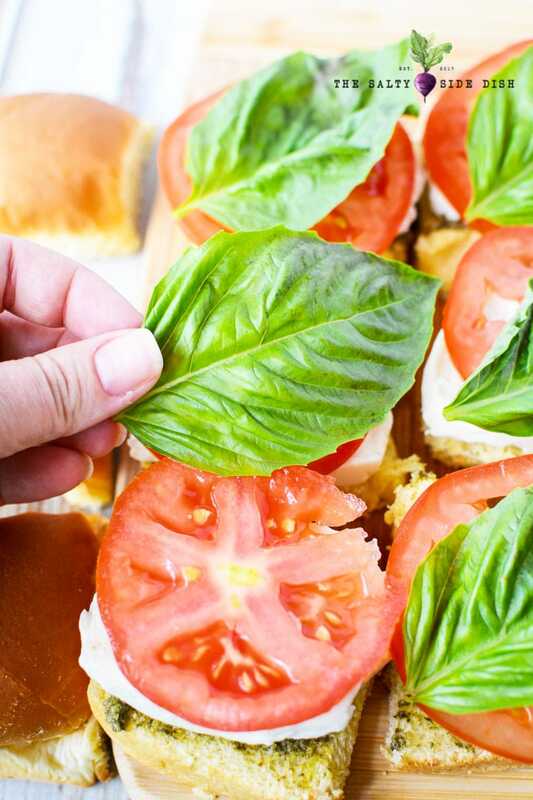 Make no mind, add your fresh mozzarella, salt and pepper and a basil leaf right on your Hawaiian roll or ciabatta roll for the perfect lunch! Preheat oven to 350 and grease a small baking dish or baking sheet . Set aside. 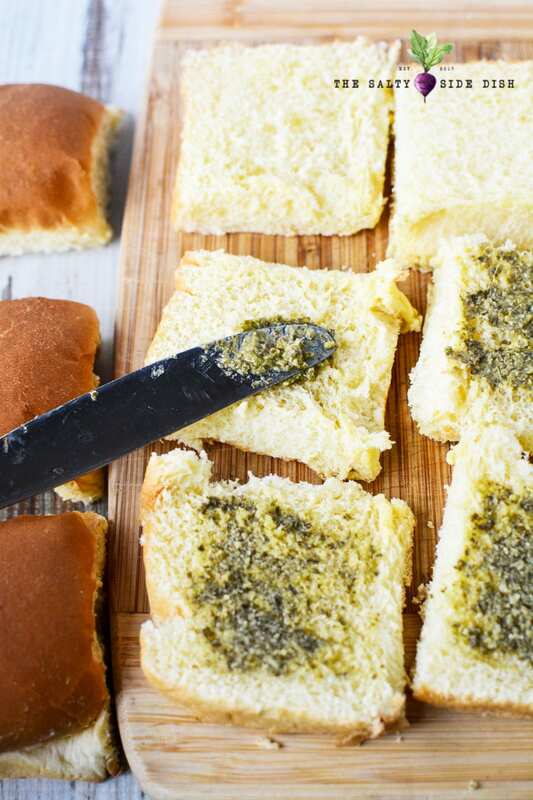 Spread basil pesto on the bottom of each sweet roll. Top with thickly sliced cheese, tomato slices and fresh basil leaf. Add top of bun to sliders and place into prepared dish. Tip: often when shopping at the grocery store for fresh mozzarella you may find mozzarella balls. Skip those! They take longer to melt and can be more uneven than your cheese. 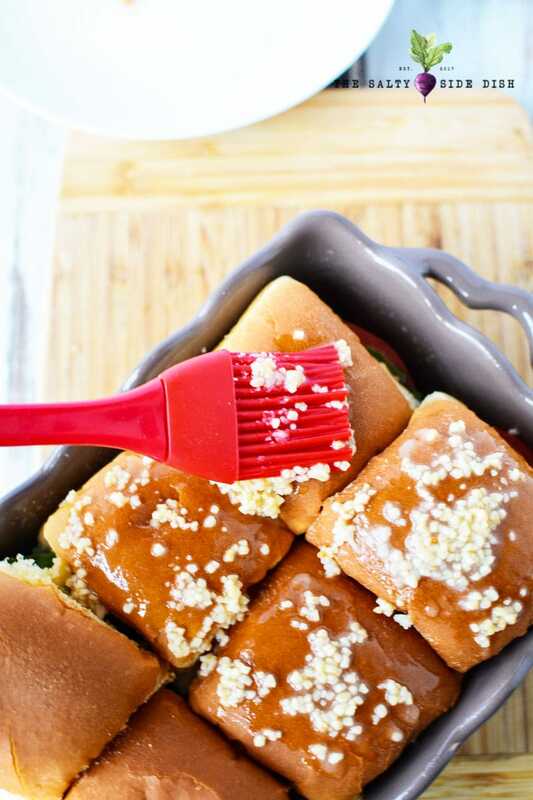 Mix together butter and garlic and spread on the tops of the buns. Serve your caprese sandwich with a balsamic reduction (you can find our recipe here) or balsamic glaze along side your mini sandwiches. CHEFS NOTE: Make up some pre-cooked, pre-sliced chicken to add to your sliders for a more filling option and to create Caprese Chicken Sliders. Nom, nom! No matter how you do it, you will LOVE them. Having a party and need other delicious food items to serve? A party IS a good reason to break the diet and make some old family favorites as well as some new amazing dishes. Christmas Tree Pull Apart Bread – Typically served in Christmas, this party appetizer is served up to look like a pretty Christmas tree. 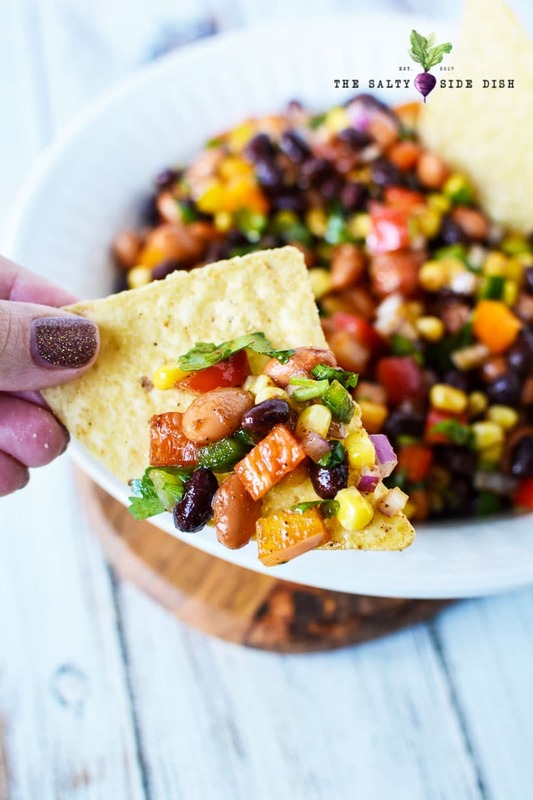 Simply pull off the sides for a one bite meal your guests will really love. Neiman Marcus Dip – Million dollar dip for a million dollar flavor! If you are spicing up your counter with a lot of dips, make sure you put this one right on it. There is a reason its a party favorite. Fresh mozzarella is totally my favorite, but I would be lying to you if I didn’t say that Burrata takes the cake on the Caprese for me. The thing is that its a specialty cheese with cream inside so could make a serious mess of your heating up lunch. You can also try other white cheeses (thickly sliced) like Provolone or Monterrey Jack, which will work in a pinch if you cant run to the store. 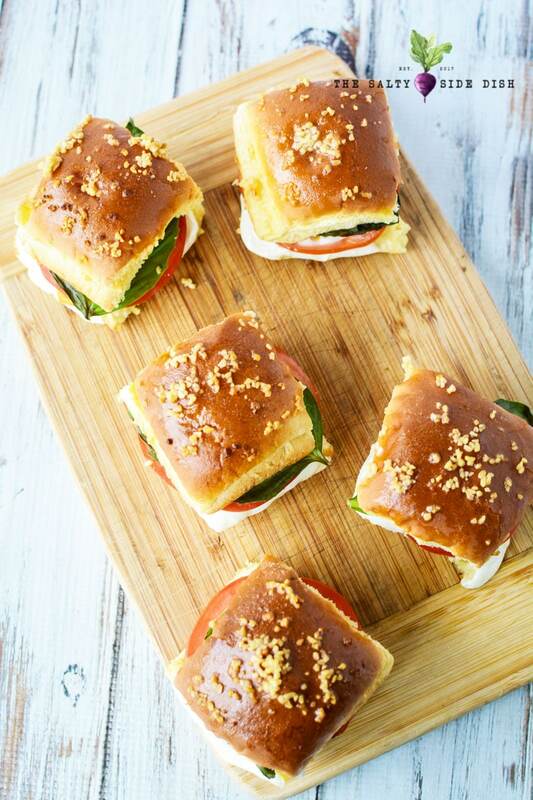 Need another sandwich to serve up as a perfect finger food appetizer? Set along side these pinwheel sandwiches with cream cheese. Such a totally different flavor and your guests will LOVE them. 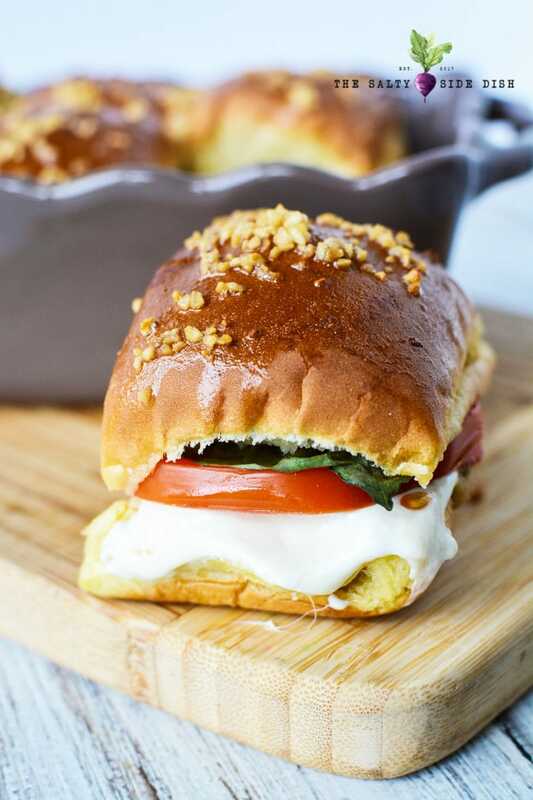 The Caprese Sandwich (often called Caprese Slider are a delicious way to get your tomato, mozzarella and basil right into a personal sized appetizers. Easy to whip up and dripping in melty cheese, talk about a party favorite. Preheat oven to 350 and grease a small baking dish or baking sheet. Set aside. Spread basil on the bottom of each roll. Top with thickly sliced cheese, tomato slices and basil leaf. HAving a Daughter who is a vegetarian has been so difficult for me because I don’t know how to cook very well, I am happy that I found your site because there are so many dishes I can make her now!